The above map shows the percent change in population over that year in each county, with counties in blue having growing populations and counties in red seeing declines over the year. Being an entrepreneur at a young age is quite challenging at many levels. With little experience and more spontaneity in making decisions, young entrepreneurs find it difficult to cope up in a high-stress environment like a business. However, the good news is that with good communication practices, this problem can be dealt with. Having a good communication model between the entrepreneur, clients and the team members vouch highly for the success of any company. Impressive communication is an essential leadership quality as well. While Americans think of think of technology and technology companies, companies like Amazon, Apple, and Google usually come to mind. And because innovation at these companies is thriving most Americans think that United States must be doing pretty well when it comes to innovation. Thus, it might come as a shock for most people to hear that there are serious problems in the American innovation economy, but MIT professors Jonathan Gruber and Simon Johnson argue that there are. The National Institute of Standards and Technology recently indicated in its “Return on Investment Initiative draft green paper” that it would issue regulations effectively ending attempts to misuse march-in rights to assert government price controls over successfully commercialized federally-funded inventions. Such an announcement was bound to elicit a reaction. That it came in The Washington Post shouldn’t be a surprise. It seems that the waves of change are not going to subside anytime soon. As AI and other advanced technologies permeate the workplace, flipping mindsets, learning new behaviours and skills and shaping organizational cultures are causing us to radically rethink work in ways that maximize the intelligences of both humans and machines. Leading companies are recognizing that these technologies are most effective when they complement humans, not replace them. In this episode of the McKinsey Podcast, McKinsey Quarterly executive editor Tim Dickson speaks with senior partner Sven Smit about how companies can be more resilient in the face of an impending economic downturn. 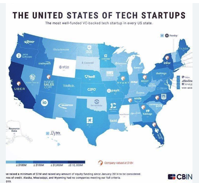 Danny Chavez on LinkedIn: "A map of the most well-funded VC-backed tech startup in every US state. #tech #capital #fundraising @wpengine in #Texas"
Last year, Mark Cuban scoffed at the idea that coding is the be all and end all to professional success. He said he believes automation will eventually eliminate many of today's in-demand software jobs. Instead, Cuban heralded creative and critical thinking as the next most in-demand job skills. And guess what? The Shark Tank oracle just might be right. Now there's real data to prove it. Over the last decade, Sweden has established itself as an innovation center, becoming well known across traditional tech circles as a hub of entrepreneurial activity. On a per capita basis, the country generates more billion-dollar VC-backed companies than anywhere else in the world excluding Silicon Valley. Spotify, Skype, iZettle, Klarna, Oatly, Minecraft, King, to name a few, can all be classified as Swedish “unicorns." Almost half of Americans are unhappy at work, according to the Conference Board’s latest Job Satisfaction Survey. If you’re among them, perhaps it’s time to act. Whether you’ve been at the same job for years or you’re fairly new and are unsure of your direction, consider doing some spring cleaning with your career. Take some time for reflection and identify tasks or roles that should be swept away, says Cheryl Hyatt, partner at Hyatt-Fennell Executive Search. Why hasn't evolution dealt with the illnesses of aging? Life pits the order and intricacy of biology against the ceaseless chaos of physics. The second law of thermodynamics, or the thermodynamic arrow of time, states that any natural system will always tend towards increasing disorder. Biological aging is no different, making death inevitable. However, one of the least-addressed questions of aging is the apparent paradox between the optimizing drive of evolution, and the inevitable deterioration of the body. 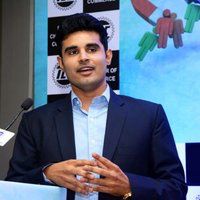 Entrepreneurship is not just conceiving a business idea that too which is different from the world but also includes the passion it takes to translate this dream into Reality. Entrepreneurship is a very broad term and it takes a lot to be an Entrepreneur. There are several hurdles that come along the way in this journey and there are no short cuts except relentless hard work, willingness to achieve or a miraculous idea.